Mucormycosis, also known as zygomycosis, is an opportunistic and lethal mycological infection caused by a fungus of the order Mucorales. The genera most frequently involved are Rhizopus, Absidia and Mucor. It is mostly observed in immunocompromised patients such as those with hematological malignancy or those who have solid organ transplantation (SOT) or bone marrow transplants. Clinical manifestations include rhinocerebral, pulmonary, gastrointestinal, cutaneous and disseminated infections. Rhinocerebral mucormycosis (RM) is the most common form. The infection usually starts in the middle nasal meatus and spreads to the paranasal sinuses, the orbit and the intracranial structures by direct extension or through blood vessels. Early diagnosis, initiating prompt surgical and medical therapy and correcting the underlying conditions play a vital role in eliminating this infection, but mortality remains high. Mucormycosis is uncommon in SOT recipients and most cases have been reported after liver or renal transplantation. We report an unusual case of RM in a 5-month heart transplant recipient. A 52-year-old male patient was transferred to our department from another center for retroorbital pain, headache and decreased vision accuracy in the left eye for the past 36 h. Five months earlier, he had undergone orthotopic heart transplantation under the bicaval technique due to ischemic heart failure. His medical history was significant for type II diabetes mellitus, poorly controlled by insulin. He also had hypertension and dyslipidemia (both under treatment) and nondialysis-dependent chronic kidney disease. His baseline immunosuppressive regimen consisted of prednisone, tacrolimus and mycophenolic acid and he was also taking prophylactic antibiotics: Cotrimoxazole, valganciclovir and isoniazid with pyridoxine. Physical examination on admission showed that the patient was alert, orientated, afebrile and his vital signs were stable. Anterior rhinoscopy, endoscopy with 0° rigid endoscope and examination of the oral cavity were unremarkable. Although the nasal exploration was normal, in view of the symptoms and the previous transplant, two samples endoscopically directed, one of the nasal fossa by swabbing and the second of the middle meatus were collected. Blood tests showed glucose levels of 248 mg/dL (13.8 mmol/L) and creatinine of 3.63 mg/dL. Computed tomography (CT) scan revealed soft tissue opacification of left anterior ethmoid sinus and inflammatory changes in the apex of the left orbit [Figure 1]a. The metabolic derangement was treated, intravenous antibiotics (piperacillin/tazobactam 2000/250 mg 8 hourly) was started and insulin was administered on a sliding scale. On the second day of hospitalization, the patient's clinical status worsened dramatically. Left eye movements were limited in all directions (frozen eye) and the left pupil was mydriatic. Signs of central retinal artery occlusion were found on the left fundoscopy: Edema and papillary pallor, posterior pole retinal edema and arteriolar sclerosis [Figure 1]b. A second nasal 0° rigid endoscope showed necrotic tissue in the left middle meatus and the middle turbinate [Figure 1]c. The microbiological study showed a Rhizopus fungus. The lactophenol cotton blue preparation revealed a sporangium located on the columella at the apical end of the sporangiophore [Figure 1]d. Following the confirmation of RM, intravenous liposomal amphotericin B 300 mg/day was started. Immunosuppressive therapy was decreased, mycophenolic acid was stopped and tacrolimus was reduced. The magnetic resonance imaging showed that infection had progressed in the apex of the left orbit, involving the cavernous sinus. We proposed extensive surgical treatment via left paralateral rhinotomy with orbital exenteration and total ethmoidectomy. The patient declined the treatment and died 8 days later. Mucormycosis is an infrequent invasive acute fungal infection in SOT recipients. Its incidence has increased over the last 20 years due to increasing use of immunosuppressive drugs. It appears most frequently in the first 6 months after transplantation due to the higher immunosuppression. The incidence ranges from 0.4% to 16% depending on the SOT type and is 0%–0.6% in heart transplant recipients. Other significant predisposing conditions to mucormycosis in SOT recipients are poorly controlled diabetes mellitus and renal failure. Several studies have shown a significant association between diabetes mellitus and RM. Roden et al. found rhinocerebral infection of mucormycosis in 66% of patients with diabetes. The fungus spreads quickly in a medium of elevated glucose and acid pH  and it is unusual in patients with metabolically controlled diabetes. The main protection against hyphae is neutrophils, but low serum pH decreases their pathogenic and chemotactic capacity. Our patient had three predisposing conditions: Immunosuppression for SOT, poorly controlled diabetes mellitus and renal failure. Three main ways of transmission of mucormycosis in transplant recipients have been reported: Inhalation in approximately 70%, ingestion in 2% and percutaneous introduction in 13%. The most common form is RM and it usually occurs through inhalation of spores. Infection begins with the involvement of the paranasal sinus and the palate. It then extends to the orbit and periorbital area where it can produce the orbital apex syndrome with ophthalmoplegia, ptosis, mydriasis and decreased visual accuracy. Finally, it disseminates to the cavernous sinus and then to the meninges and brain. Clinical presentation of the disease usually involves symptoms of sinusitis and periorbital cellulitis with facial pain and decreased vision. Advanced stages include meningitis, cerebral abscess and multiple cranial nerve palsies. Ophthalmoplegia with loss of vision may also be present, indicating progressive orbital involvement. Oral cavity examination can reveal gingival or palatal eschar. A nasal endoscopy and a biopsy or a culture of the infected area are essential for the definitive diagnosis. A culture gives us more information about the species of Mucorales, but it has a higher rate of false negatives than the biopsy. The absence of black necrotic eschar does not exclude the possibility of mucormycosis. Bhansali et al. and Yohai et al. reported nasal ulceration or necrosis in 48% and 78% respectively in RM. In our case, the initial nasal endoscopy was unremarkable, but we performed a middle meatus culture in view of the high suspicion of RM and the culture revealed a fungus of the order Mucorales. Imaging studies are not specific for RM. The contrast-enhanced sinus CT is helpful to delimit the extension of RM and reveal signs of invasion. Magnetic resonance is more sensitive than CT to evaluate intradural and intracranial involvement, the cavernous sinus thrombosis and thrombosis of the cavernous portions of the internal carotid artery. Treatment is a combination of aggressive surgical debridement and systemic antifungal therapy. Radical resection removing all necrotic tissue should be done and various debridements are usually required. Lateral rhinotomy, orbital exenteration and occasionally intracranial surgery are performed depending on the extension of RM. Orbital exenteration is necessary when the orbit is infected with limited eye movements in all directions (frozen eye) and loss of vision. The surgery that we proposed to our patient was a left paralateral rhinotomy with orbital exenteration and total ethmoidectomy removing all the unviable tissue. Amphotericin B is the drug of selection, but it is limited because of its renal and systemic toxic effect. Liposomal amphotericin B is less nephrotoxic. This lipid formulation improves circulation time and concentration in the infected area of the associated amphotericin B. The duration of the treatment is not explicitly established. Rectification of underlying conditions is also necessary. The correction of ketoacidosis is important. Survival rates in diabetic patients with RM are higher than those in patients with other predisposing factors such as renal failure, hematologic malignancies or autoimmune diseases. Immunosuppressive therapy should also be decreased. Prognosis of RM is poor. Despite the aggressive surgical and antifungal therapy, the mortality rate remains high, ranging from 32% to 75% in reported series. Patients with the lowest chance of survival are those who are immunocompromised. A delay in diagnosis and treatment, brain involvement, hemiparesis, bilateral sinus involvement and facial necrosis is also associated with poor survival. RM is a rare and aggressive fungal infection in heart transplant recipients and carries a high mortality rate. Early diagnosis and correction of underlying factors is fundamental. Imaging studies and nasal endoscopy should be performed in patients with predisposing factors. Treatment is wide surgical debridement in combination with systemic antifungal therapy. Chakrabarti A, Chatterjee SS, Das A, Panda N, Shivaprakash MR, Kaur A, et al. Invasive zygomycosis in India: Experience in a tertiary care hospital. Postgrad Med J 2009;85:573-81. Lanternier F, Dannaoui E, Morizot G, Elie C, Garcia-Hermoso D, Huerre M, et al. Aglobal analysis of mucormycosis in France: The RetroZygo Study (2005-2007). Clin Infect Dis 2012;54 Suppl 1:S35-43. Anand VK, Alemar G, Griswold JA Jr. Intracranial complications of mucormycosis: An experimental model and clinical review. Laryngoscope 1992;102:656-62. Gonzalez CE, Rinaldi MG, Sugar AM. Zygomycosis. Infect Dis Clin North Am 2002;16:895-914, vi. Singh N, Gayowski T, Singh J, Yu VL. Invasive gastrointestinal zygomycosis in a liver transplant recipient: Case report and review of zygomycosis in solid-organ transplant recipients. Clin Infect Dis 1995;20:617-20. Bodenstein NP, McIntosh WA, Vlantis AC, Urquhart AC. 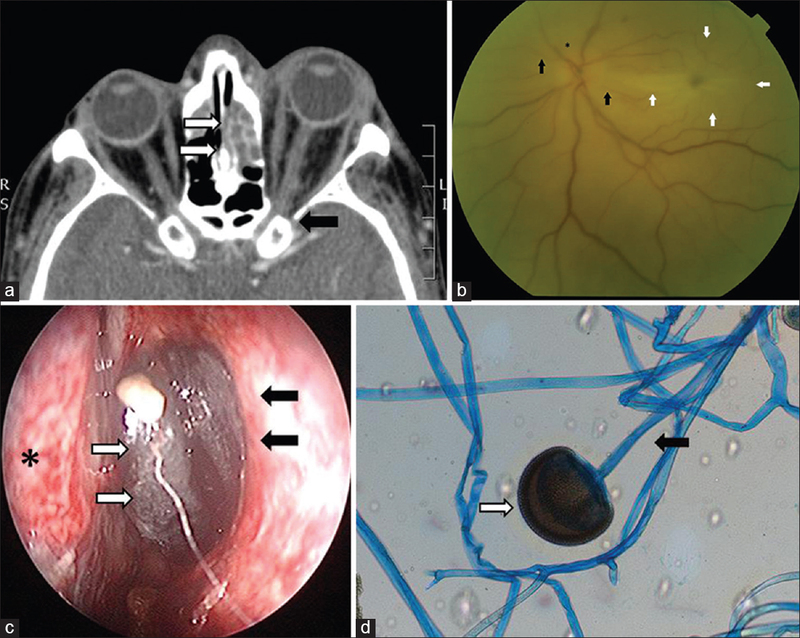 Clinical signs of orbital ischemia in rhino-orbitocerebral mucormycosis. Laryngoscope 1993;103:1357-61. Tarrand JJ, Lichterfeld M, Warraich I, Luna M, Han XY, May GS, et al. Diagnosis of invasive septate mold infections. A correlation of microbiological culture and histologic or cytologic examination. Am J Clin Pathol 2003;119:854-8. Ferry AP, Abedi S. Diagnosis and management of rhino-orbitocerebral mucormycosis (phycomycosis). A report of 16 personally observed cases. Ophthalmology 1983;90:1096-104. Walsh TJ, Hiemenz JW, Seibel NL, Perfect JR, Horwith G, Lee L, et al. Amphotericin B lipid complex for invasive fungal infections: Analysis of safety and efficacy in 556 cases. Clin Infect Dis 1998;26:1383-96. Uçkay I, Chalandon Y, Sartoretti P, Rohner P, Berney T, Hadaya K, et al. Invasive zygomycosis in transplant recipients. Clin Transplant 2007;21:577-82.